Originating from the royal chapel at the Château Vieux de Saint-Germain-en-Laye, this painting formed the altarpiece of the queen's side-altar. It illustrates the piety of Queen Anne of Austria. Its pendant is Saint Louis Distributing Alms at the historical museum at Bazas in the Gironde. This latter painting adorned the king's side-altar and depicts the generosity of King Louis XIII. 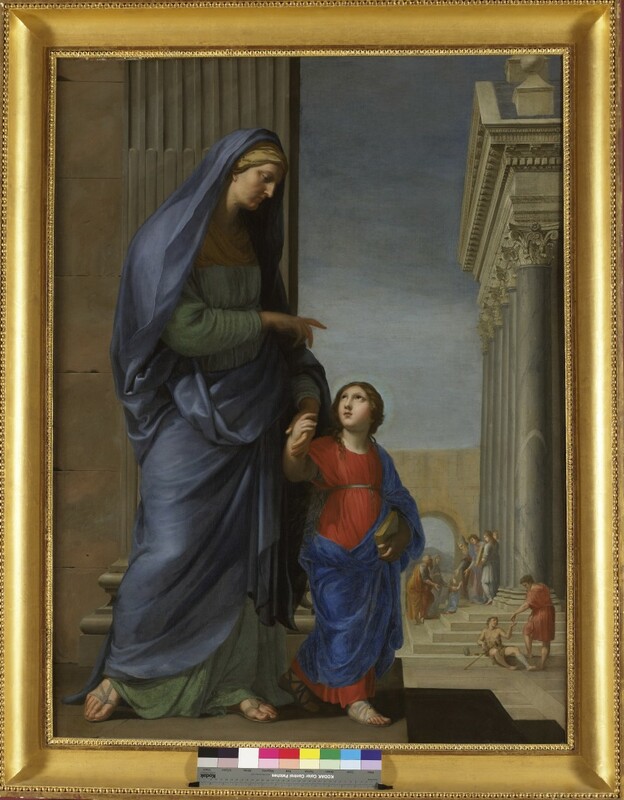 The austerity and clarity of the composition, framed by the classical architecture, the sculptural quality of the main figure of Saint Anne and the contrasting colours bring to mind the bas-reliefs of antiquity. It is one of the first masterpieces of 'Parisian Atticism', the first classical French art that included such leading lights as Nicolas Poussin, who spent time in Paris between 1640 and 1642. Poussin was also responsible for the painting that adorned the high altar in the same chapel: The Institution of the Eucharist (Louvre Museum). Stella was friends with Poussin and got to know him well when they were in Rome. He returned to Paris in the second half of the 1630s, along with two other proponents of the new style that became known as 'classical': Claude Mellan and Remy Vuibert.